Cove Fort (1867-1890) - First established 29 April 1867 by Ira Hinckley and his family. Built on the site of the earlier Fort Willden. Served as a way station until 1890. Occupied until 13 August 1988 when it was donated the LDS Church for restoration as a historic site. Established by Ira Hinckley in 1867 during the Ute Black Hawk War at the direction of Brigham Young to protect travelers, U.S. mail carriers, and the Deseret Telegraph. 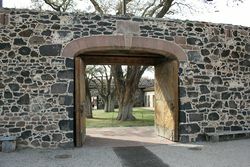 The Fort became a way station for the stage route that ran along the Wasach Mountains and serviced travelers through the region up until 1890. Two stages a day stopped at the fort, one northbound and one southbound, and the Hinckley family provided the drivers and the passengers with meals and lodging as well as replacement teams and repairs. The crude Fort Willden housed the construction crew building Cove Fort. 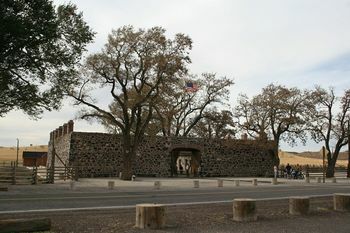 The Fort was completed in seven months between April and November, 1867. 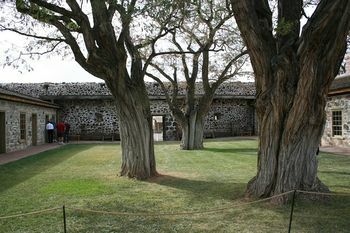 The walls of the fort form a square which is 100 feet on each side. The walls are eighteen feet high and made of black volcanic rock and dark limestone, they taper from four feet thick at the base to two and a half feet thick at the top. Internal stone rooms line the north and south walls with six rooms along each wall built with higher quality stone. The south rooms served as offices and the kitchen/dining room while the north rooms were the living/sleeping quarters. 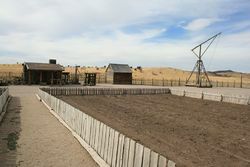 External buildings housed a blacksmith shop, ice house, bunk house and a large barn. On 9 May 1992 LDS general authority Gordon B. Hinckley dedicated the newly restored fort. Excellent restoration with many original materials and artifacts. Open to the public with excellent guided tours by LDS members. Location: Cove Fort, Millard County, Utah.